Private buyer Jemimah Barnett reveals what to look for and the questions to ask when buying a property. 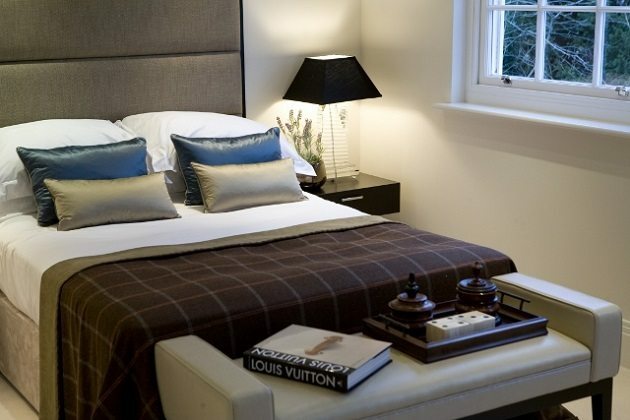 Many Britons would regard employing a private buyer – someone who represents you when purchasing a property – as a luxury. However, in many countries, such as the US and Canada, it’s standard protocol and after chatting to Jemimah Barnett about her work, it makes you wonder why more people don’t take advantage of this service in the UK. She also makes the point that agents representing the vendor will be a lot more candid with private buyers, which can help negotiations enormously, and that half of all stock sold in London is never marketed, so you wouldn’t even know it’s available. As you get into the higher price brackets of eight million plus, she says, around 80 per cent of properties aren’t put on the market, so you only have access to these through a private buyer, such as herself. 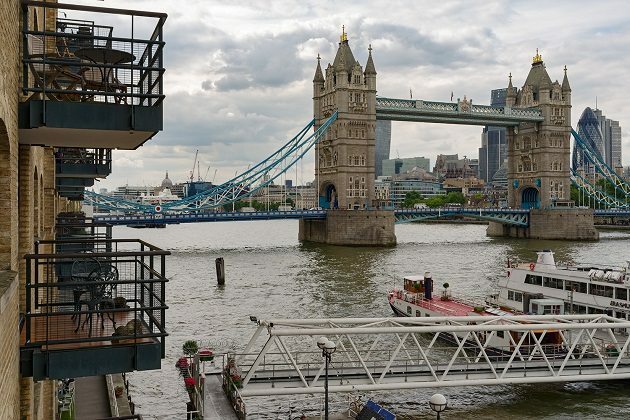 However, if you’re a first time buyer in London, you probably aren’t looking at that price range and should probably take a look at our first-time buyer guide to London. 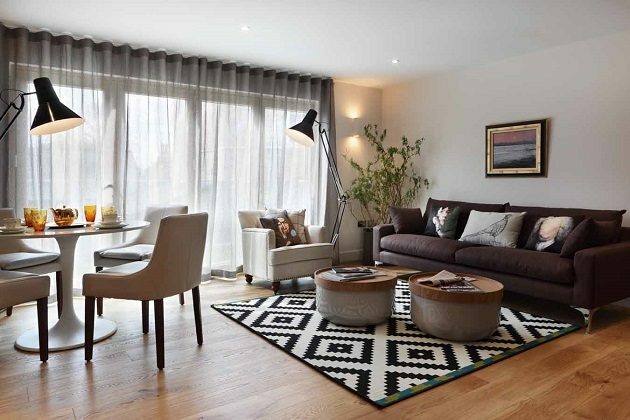 Here, Jemimah talks to us about the property market and what to look for when buying a home. View from a riverside apartment designed by Almas Shamsee of Maisha Design. Is London different to the rest of the UK? Yes, massively. There are thousands of agents within central London, a lot of them are small companies or independents and then, obviously, there are the big firms but they don’t actually control a mega market share. So that’s quite unusual, people running around sort of doing a bit of everything, which creates quite a chaotic but competitive environment. Also there’s really no data available to buyers or sellers in real time, which definitely creates a level of competition on a backdrop of high prices. So, it’s enormously competitive, one of the most competitive markets anywhere in the world, including New York and Hong Kong. But the rest of the UK, less so, just because they’re suburban markets, they operate more like suburban markets anywhere else in the world. Award winning designer Clare Pascoe of Pascoe Interiors creates a modern mid-century inspired interior design scheme for this show home in Chichester. When you go to a property, what do you look for? Do you have a checklist? I don’t have a checklist, no. I think if you were starting out in the job, you would need to run through one but once you’ve seen a thousand properties you just start to do it automatically. I always advise buyers to try not to focus on little things. You tend to see buyers who are looking for problems, so they’ll look for a tap that’s leaking, or areas that might be damp, and those things are important to watch out for but your surveyor will do that so you don’t need to worry about those. What do you need to worry about is: can I live in this house? Does it suit my lifestyle? And those things are about layout and light and how you feel in the property. For example, a lot of terraced houses in London are very tall and narrow, so they might have a lot of square footage but not be appropriate for a family with young children. 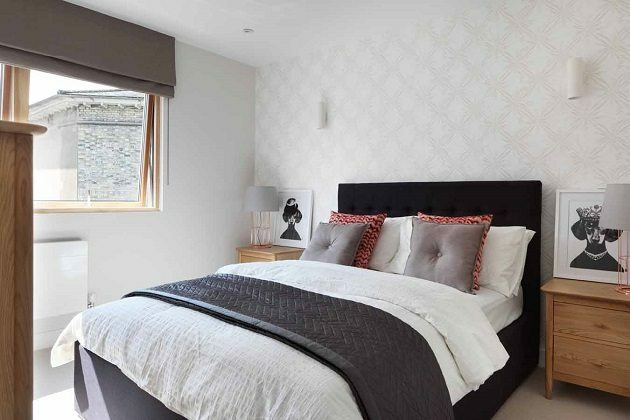 Clare Pascoe of Pascoe Interiors creates a simple but sophisticated bedroom in this modern townhouse in Chichester. What key questions should people be asking sellers when looking at a property? Always ask a seller how long they’ve lived in the property and why they’re moving. That’s going to give you some important insight into the house. They might not be upfront with you but if they seem cagey about answering the question, then there might be something wrong with the house or the neighbours. If it’s a reason like, “oh, our family’s got bigger” or “the kids are now in high school”, those are great reasons and that means there’s nothing wrong with the house. It’s a particularly great sign from vendors who’ve stayed in their own house for a long time, because they’ve probably looked after it and viewed it as a home. Also, ask the vendor what they’re trying to achieve, because it gives you some basis to negotiate effectively. If they’re a family who want to move because their kids have moved school, then there are the obvious few questions that follow on from that. When are the kids going to start in their new school? Have you found a new home to move to? Because, if the kids begin school in three months and they’ve found a house they love right down the road from it, then they need a quick sale and they’re going to prioritise that over getting slightly more money a year from now. And then finally I would say just simple things like: do they know their neighbours? What’s the area like? Go ahead, ask all those questions. 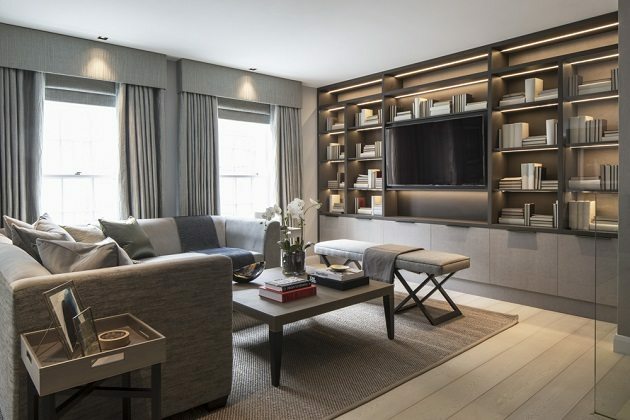 Roselind Wilson of Roselind Wilson Design was asked to create a contemporary interior design scheme for this turnkey development in Belgravia. What are the initial steps you should take when starting your search for a home? Before you go out on any viewing you have to be clear on your budget and how you’re financing the purchase, because that’s going to dictate your timeline. Also, get an idea for what your budget will buy and narrow down locations. You can do a lot of research online. So that’s your research and planning stage and, at the end of that stage but before you start going out and looking at homes, you need to find a great solicitor as things can move quite quickly. That’s one thing people don’t grasp in the UK, is how important that role is. Next to your agent, that is the single most important hire you’re going to make, it needs to be done well ahead of time so that they can process all your paperwork and have everything ready. Designed by award winning designer Roselind Wilson of Roselind Wilson Design. Do you think that perception of your services is changing? I think it’s changing a lot. I work mostly with high-net-worth individuals but there are a lot of buyer agents working with people on much lower budgets. It doesn’t matter if your budget is £500,000 or £5 million, you absolutely need an agent if you want to see everything in London because of how much is hidden. Also, if my client was able to negotiate a 5 per cent discount then it’s quite likely I’ll be able to negotiate at least 10 per cent because I do this all day and agents are actually quite candid among themselves. So, while an agent might say to a buyer wandering around a house, “oh, we won’t take a penny less than £900,000 and we’ve had loads of interest”, to me he would say, “we’re actually looking for £820 [thousand] and no lower, and we want to sell by next month, how can we do the deal?” It’s a totally different conversation. 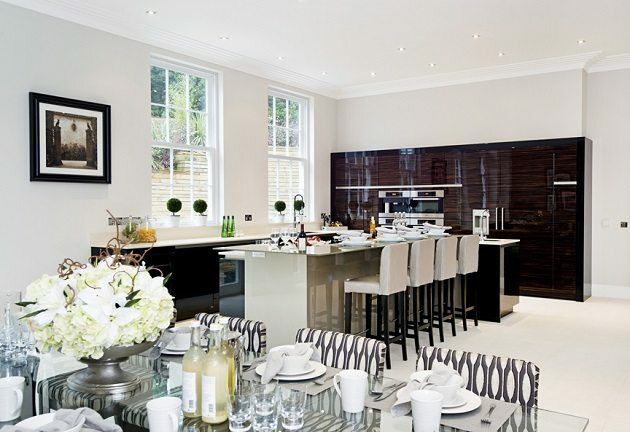 This dark wood lacquered kitchen by Halo Interiors strikes a stunning contrast to the neutral coloured living space. When people come to you, what concerns do they usually have? Well I work with a lot of overseas buyers and what they’re concerned with mostly is: is it a good investment? Largely speaking, even when they’re buying homes to live in, it is still an investment so they want to be sure that they’re engaging someone who really knows the market, has the ability to do due diligence and will speak candidly with them. For example, there’s a lot of new builds that come on the market, which aren’t great investments, so get offloaded onto first-time buyers, overseas buyers and what we would call vulnerable buyers who aren’t getting great guidance. I would say that of everything that’s come on the market in the new-build space in London, there’s maybe less than one in 20 developments that I would put forward to a client of mine. Many are poorly positioned or there’s too much development on the site, with units too close together looking right into each other’s living rooms, that kind of thing. All of these big companies, their main concern is not to develop the site for buyers, it’s to develop the site for profit for shareholders. So they’ll put a job out for tender, and whichever architectural firm can deliver a plan that produces the most number of units will get the job. That is why almost all new builds in London don’t even have somewhere to store your vacuum cleaner, the bedroom floor plans are tiny and the ceilings are low. 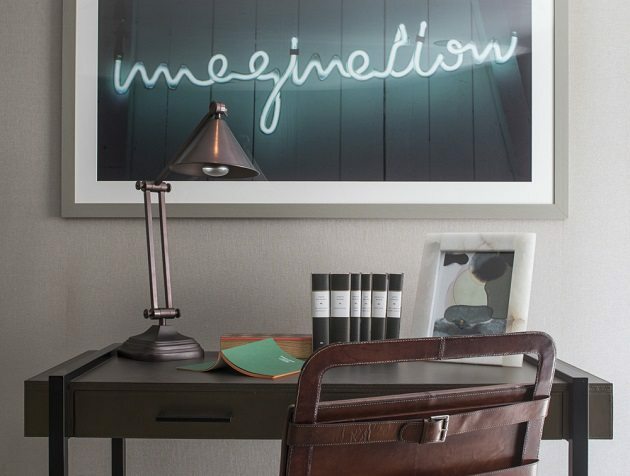 This guest bedroom by Halo Design Interiors exudes a hotel chic aesthetic thanks to a sleek leather upholstered bed and bench seat for bags and books. Finally, what, in your opinion, are the key areas in London at the moment that people should be looking at? Personally, I think there’s a huge glut of monstrously overpriced things happening in the south east. I’m not really recommending east London right now at all, actually, as I think it has hit its ceiling, especially in terms of its value compared to local wages. So circling back to south-west London, everything that wraps around Hyde Park; everything from Mayfair down through Belgravia and then across to Kensington, Holland Park and Notting Hill. This area has always been an old-money, fantastic place to live and it’s always going to be where my clients want to be. However, I think more and more you’re seeing those areas bleed out west. Earls Court has become much nicer and now, as you move out west, Fulham’s improving enormously and you’ve got beautiful developments going up in Chiswick. Even in Acton, you see a lot of buyers buying for investment there, and in Ealing, places that maybe 20 years ago weren’t so glam to live in, but they are 15 minutes on the train or a 20 minute drive from Chelsea. They’re somewhere where you could buy a family home. So, anything in the south-west basically. There are never too many questions you can ask when looking around. For example, make sure you know what to do if the contract has an uplift clause.